Kresha bridal clientele increases every day and she makes sure she never replicates an exact design. She works with each individual until they find the ideal silhouette and colour palette and then designs bespoke clothing that has a wonderful edge making the clothes fun and memorable. 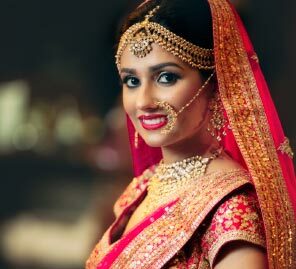 Naturally, when it was time for her to wed her longtime boyfriend Vanraj Zaveri, in the three months leading up to the wedding, she decided to design and execute not just both their wedding wardrobes but also those of her family and some friends! 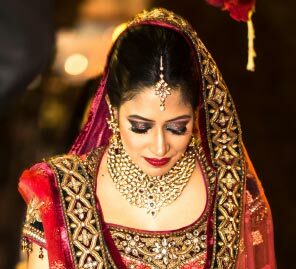 Here she tells us about their unique looks at their grand celebration in Udaipur. Vanraj and I were keen on Udaipur for its architectural grandeur and rich history and of course, the beauty of the city. We wanted a beautiful, intimate setting and for us, the obvious choice was The Leela Palace Hotel. Evoking the splendour of Udaipur’s rich and royal heritage, The Leela’s service and hospitality is unmatched. We hosted the Mehndi in the guava gardens, al fresco and under the Udaipur sun so I wanted something fun and easy to sit in while my mehndi was done. 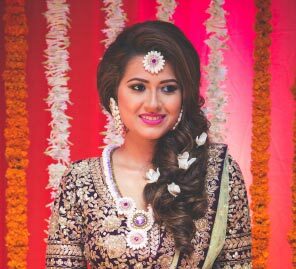 At my first visit to the garden, I was delighted by the birds, butterflies and bugs and so I decided to use bird motifs on my lehenga as well as Vanraj’s bandhi. Aiming for an elegant, lightweight outfit, I created a beautiful pastel green lehenga in organza, completely covered in multi colored pastel resham birds and floral vines embellished with laser cut mirrorwork. I went edgy with the blouse and wore a completely backless choli with prominent birds on either side and no dupatta. Kresha designed a unique backless blouse with prominent birds on either sides and skipped the dupatta for her mehndi. Vanraj created fringe pearl earrings and a beautiful maang tikka for Kresha's mehndi look. The idea was to sparkle on stage and also dance the night away and so I chose a bold royal blue with signature Koecsh self-coloured work. I wanted this dress to be all glamour and luxury so I used glass beading, sequins and crystals. I opted out of adding gold or silver and kept the look minimal and monotone. The bold royal blue sangeet lehenga with self coloured signature Koecsh work in glass beading, sequins and crystals. I felt a bit challenged by the pheras. I don’t like not being able to use the same garment multiple times on multiple occasions. One evening, I watched an episode of The Real Housewives of Beverly Hills and saw cast member Adrienne Maloof’s framed wedding dress. I had already acknowledged that my wedding lehenga would be something I wore only once, so I decided to turn it into a future piece of art that I will frame once my house is ready. I embroidered the lehenga with our story - our milestones, the proposal, and all our important moments until the wedding. Vanraj had picked white and gold as the colours of the wedding and I was ecstatic with his choice. Our parents and family didn't mind at all, in fact they thought the colors were very elegant and timeless. This was a classic 14 kali lehenga. I wanted it to be timeless. It’s a beautiful mix of traditional materials like saadi, nakshi, kardana, salli, tikki, zari and pearls and I’ve used zardosi and aari embroidery techniques. For the blouse, I went with a conservative 3/4th sleeve blouse with a beautiful neckline and super low back. My draped dupatta had graphic patterns and was finished with a hem of jumping dolphins. For my head dupatta, I kept it super light so it would be easy and comfortable to wear. On the day, even though I was wearing this beautiful, traditional outfit (with subtle nods to all my craziness embroidered into it) I still wanted another edgy element that made my look more fun, so I decided to pair it with gold Giuseppe Zanotti shoes. While researching the fabric for Vanraj we came across this gorgeous novelty silk primarily used in men’s kurtas and sherwanis. It’s appeal is its matte finish - like most silk blends, it had richness and a lovely fall but not that prominent shine or two-tone effect. The 14 kali lehenga embroidered with Kresha and Vanraj's proposal story and milestones until the wedding. Kresha and Vanraj's names were hand sewn with beautiful zari, which was hidden into the embroidery of the lehenga fabric, forming a delicate optical illusion. The bottom of the wedding lehenga and dupatta was finished with a hem of jumping dolphins as part of the couple's love story. Vanraj's sherwani was crafted out of white novelty silk fabric. Just as he left the clothes up to me, I left the jewellery completely up to Vanraj. In most cases, I only ended up seeing the actual jewellery just days or hours before the function. For the mehndi, he created very beautiful fringe pearl earrings and a lovely maangtikka that went perfectly with my look. For the sangeet, Vanraj made me a very unique necklace and beautiful diamond drop earrings with an extremely tiny and contemporary maang tikka. He personally designed a jadau necklace for the pheras – it was like nothing I had ever seen! He took something so rich in tradition and elevated it into such a modern design – he captured my aesthetic with each piece, perfectly! Vanraj designed a Jadau necklace for Kresha for the pheras with a modern touch. Kresha added an edgy element to her traditional look with contemporary Giuseppe Zanotti heels in gold. Stay true to yourself, and at the end of the day it’s a celebration, so if you aren't having the BEST time creating your own outfits then DON'T do it.